Since its formation in the mid-1970’s the band has established itself as Kentucky’s pre-eminent piping and drumming group. 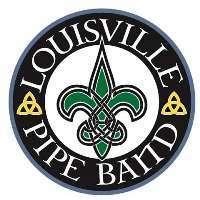 Organized piping and drumming in Louisville and therefore the LPB, dates to the mid-1970’s. At that time, two area high schools periodically used the Great Highland Bagpipe as a part of their band programs — Jeffersontown High School beginning in the mid-1960’s and later, Floyd Central High School in southern Indiana. The Kosair Shriners also sponsored a bagpipe unit. Most original members of the band came from one of these organizations. At this time, several members of the Jeffersontown High School band made an effort to contact other pipers in the community. Robert Caudill, Skip Cleavinger, David James and Rob Modys were involved in these early sessions. Rehearsals began at St. Andrew’s Episcopal Church and Billy Wallace was the band’s first Drum Sergeant. The band had no matching gear but did manage to present several regional performances before dissolving following the departure of key members to attend college. Shortly afterward, Bill Wallace, a member of the Kosair band, assembled some of his more promising students into the Pegasus Pipe Band. With the inclusion of weekend members from the earlier group, the band grew under PM Charlie Marlatt’s direction. During this period, the band began to purchase uniforms, other matching materials, and began to compete. PM Marlatt was a founder of the Highland Games in Carrollton, Kentucky and under his leadership the band was host to the first incarnation of that event. Dr. Andy Henry then served briefly as interim PM before Robert Caudill (a Jeffersontown H.S. alumnus who had played in the band’s earliest versions) returned from college to rebuild the group once again. From 1984 – 2005, PM Caudill organized the band around an educational format. The band’s name was changed to the Louisville Pipe Band and a training program was instituted. Pat Benningfield led the band from 1992 – 1995 and again in 2007 – 2009 and emphasized competition success and an elevated standard of play. Anne Marie deZeeu lead the band from 2010 to 2014. Currently, the band is led by Ted Palmer.